Produce faster & more accurate trade quotes and invoices. Too Easy. easyTrack centralises all of your business admin in one place on the web. Whether you're a large or small, easyTrack can improve and automate all of those admin jobs we hate. Web based access allowing you to login from anywhere. Now is the time to make your job easier and upgrade to a software package that will do the heavy lifting for you. Get your 30 day free trial now. 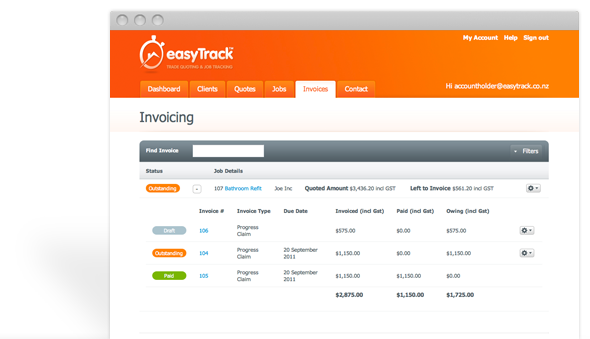 easyTrack is for all tradespeople who deal with estimates, quotes and charge up jobs helping you to work smarter. Add up to two additional users when you employ easyTracks job quoting software and enjoy more great features coming soon. All this from just $29 per month for a registered user. Contact us NOW or Register for your No obligation 30 day free trial. When you register online for your free trial please allow up to one business day for your account to be activated or call us on 0800 432798 for more immediate access. We are suppliers of the original Super Mini Booster - portable emergency power pack. Don't get caught stranded with a flat battery. This battery power pack will instantly start your vehicle without the need for another vehicle or jumper leads. Store all your clients information in one central location. The dashboard provides up to the minute statistics of all your quotes, jobs and invoices. Quotes and invoices are emailed direct to your clients for faster turn-around. © Copyright EsiTreq Ltd. All rights reserved.